Enamine has developed the world’s largest reputable collection of chemical compounds, carefully designed and produced for Life Science industries: currently 2 million screening compounds with 27,000 fragments and over 70,000 building blocks. Comprehensive services in lead discovery and optimization are available including integrated biomolecular and ADME/TOX screening, all on-site. PerkinElmer Informatics delivers software and services globally for research, discovery, analysis and collaboration across multiple industries. PerkinElmer’s Ensemble solution, with the TIBCO Spotfire® platform, supports crucial informatics activities for scientific research and development applications. Informatics products include ChemBioOffice®, ChemDraw®, E-Notebook and LES systems for knowledge management and integrated laboratory systems. Elsevier is the world’s leading provider of world-class science and health information and innovative tools that help researchers make critical decisions and gain insight into the sheer volume of available data. Reaxys Medicinal Chemistry is one such tool, dedicated to drug discovery research. abcr is an established supplier of specialty chemicals for the individual needs of pharmaceutical and chemical companies worldwide. Competent assistance by our chemists, worldwide sourcing activities, reliable deliveries at fair prices and excellent quality have made abcr the “preferred supplier” of many customers from catalogue up to bulk quantities. Activate Scientific is a European Catalogue supplier of multifunctional building blocks and complex scaffolds used in medicinal chemistry drug discovery. We have 14.000 novel heterocyclic synthons readily available through our offices in the UK and Germany. Our compounds are small, multifunctional molecules for constructing complex and highly functionalised entities. They are extremely versatile and powerful synthetic tools to provide chemical diversity for early hit-discovery, focused library production and hit-to-lead exploration. Over 18,000 organic molecules with detailed product information are available from the Acros Organics range, offering a comprehensive portfolio of essential chemicals, functional reagents and organic building blocks to meet the evolving needs of organic and medicinal chemists in the field of research, development and drug discovery. Advion is a leader in mass spectroscopy & synthesis solutions for life science. The expression CMS is a high performance mass spec. Its compact size and affordable price allows it to be placed in a fume hood or on the bench for direct access and immediate results for chemists. Aldevron provides custom services for antibody development, plasmid purification and protein production. We manufacture biologics for research, clinical, and diagnostic applications. Quality and a client focused approach have differentiated Aldevron since 1998. We aim to find customised solutions for your needs, regardless of scale, complexity or scope. Ambinter is a global supplier of advanced chemicals for drug discovery applications. Our database holds over 20 million compounds for high-throughput screening and combinatorial chemistry, as well as a large selection of building blocks and natural products. Find molecules you think of in Ambinter.com: just a few clicks and we do the rest! The American Chemical Society has served researchers at the interface of chemistry and biology for more than 130 years by publishing its largest portfolio of journals dedicated to biological and medicinal chemistry. Journals in this portfolio include leaders such as Journal of Medicinal Chemistry, ACS Medicinal Chemistry Letters and Biochemistry. AtlanChim Pharma laboratory provides customized chemical synthesis of complex molecules at small scale. One of our specialties is labeling with selective introduction of stable isotopes in all types of organic structures. Depending on your needs, we provide customized solutions such as Full Time Equivalent or Fee For Services. BioSolveIT develops custom scientific software solutions for virtual screening and lead discovery. We offer tools, services, and research collaborations. BioSolveIT catalyses products off of academic research successes with proven pharmaceutical industry application. Besides our world-renowned SBDD and LBDD software products, we are pioneers of computational fragment-based technology. Our mission is to innovate drug discovery. Biotage is a global leader in life science technology. With a broad scope of tools for synthesis, work-up, purification, evaporation and analysis, the company provides solutions, knowledge and expertise in the areas of analytical chemistry, medicinal chemistry, and process-development. Our focus is on developing technology to speed experimental procedures. CCG (Chemical Computing Group) is a leading supplier of software solutions for life sciences. With a proven track record in scientific innovation, CCG provides innovative applications in drug discovery to pharmaceutical, biotechnology and academic researchers. CCG headquarters are in Montreal (Canada), with support offices in North America, Europe and Asia. Cresset provides chemistry software and consulting services. Our field technology uses biological activity, not chemical similarity, as the key descriptor of molecules, so customers can create novel bioisosteres and compare compounds across chemical series. Businesses who invest in Cresset’s software or services deliver compounds with an excellent chance of success. 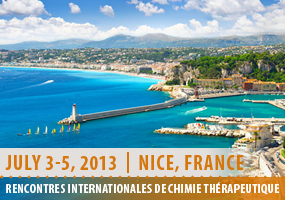 Diverchim is the leading French Contract Research Organization in chemistry for life sciences companies. Our teams combine experience in drug discovery, process development, medicinal chemistry and custom synthesis (mg to cGMP kg) to deliver you with unique chemistry solutions to achieve your requirements. DIVERCHIM also owns a catalog and patented methodologies. Dotmatics delivers a ready-to-use platform to capture, register, share, collaborate, query, visualize and analyze all the information and knowledge generated in the modern, highly collaborative scientific industries. Dotmatics’ enterprise solutions are flexible, scalable and configurable, providing effective scientific information management across entire organizations, from discovery research to development to early manufacturing. Keymical CollectionsTM: innovative and biorelevant NP-like small molecules series for HTS. Smart Fragments: Topologically diverse and 3D small molecules for FBDD. Track-proven Medicinal Chemistry: Hit exploration, Hit-to-Lead, Lead optimization, focused libraries, reference synthesis and patent exemplification. Natural Product Chemistry: Analogs and derivatives from hemi- or total synthesis (macrolatones/-lactams, anthracyclines, polyfunctionnal decalines, ...). Member of the European Lead Factory consortium. Epithelix is a leader for in vitro assessment of drug efficacy and toxicity on human respiratory tract. Epithelix has developed and offers unique 3D in vitro human airway tissues (MucilAir™-Normal, Asthma, CF, COPD, etc.) with a shelf-life of more than 1 year, allowing long-term testing, and premium in vitro testing services. Life Chemicals Inc. specializes in state-of-the-art organic synthesis for drug discovery and agrochemical research: ** Drug-like and lead-like compounds for high-throughput screening (more than 350 000 in stock) ** Carefully designed targeted libraries (Kinase, Protease, NHR, PPI, GPCR and many other) ** Custom synthesis projects ** Core building blocks. Mercachem is a leading European CRO for organic chemistry, medicinal chemistry and early process research. Our modern, state-of-the-art laboratory facilities are located in Nijmegen. Some specialized areas of expertise available at Mercachem: Synthesis of complex 3-dimensional molecules ** Target family centric libraries ** Integrated medicinal chemistry projects ** Unbiased catalyst screening. NovAliX is focusing on the development of enabling chemistry and biophysical technologies to support the pharmaceutical industry’s outsourcing needs from discovery to manufacturing. With proprietary SPR technology, protein crystallography, supramolecular MS, NMR and chemistry, NovAliX offers comprehensive integrated services for small molecule drug discovery. OmegaChem is a Canadian privately owned company. Since 1988, we supply the Pharmaceutical Industry with innovative fine chemical products and offer a wide range of value added services (FTE/CRO, custom synthesis, process optimization) to customers worldwide. Our expertise covers the development and production on fluorinated compounds and innovative building blocks. Optibrium’s StarDrop™ software guides the design and selection of high-quality compounds. It evaluates complex data, bringing confidence and intuitive simplicity to identifying chemistry with an optimal balance of properties, using unique approaches including the Glowing Molecule™ and Probabilistic Scoring. Plug-in modules add predictive modeling, idea generation and 3D SAR analysis. Oxeltis, a young successful Medicinal Chemistry oriented service company founded by former researchers from Idenix pharmaceuticals (Cambridge-MA; Montpellier-Fr). Our background for the past 10 years is linked to medicinal chemistry research with an expertise in heterocycles, macrocycles, nucleoside/nucleotide, sugar and phosphorus chemistry. Our expertise and service activity is focused on oncology and antiviral early R&D programs. Prestwick Chemical is a premium provider of medicinal chemistry services: Hit validation, Lead optimisation and Ligand profiling. Prestwick’s well trained medicinal chemists develop innovative strategies tailored to clients’ needs. They are supported by state-of-art computational ligand design, and take into account ADME/Tox and selectivity issues. Prestwick also offers innovative smart screening libraries. Sigma-Aldrich is a leading Life Science and High Technology company whose biochemical and organic chemical products, kits and services are used in scientific research, biotechnology, pharmaceutical development, the diagnosis of disease and as key components in pharmaceutical, diagnostics and high technology manufacturing. SpiroChem AG is a Swiss fine chemicals company providing high-value-added building blocks for the pharmaceutical and agrochemical industries. SpiroChem designs and commercializes a large range of small-rings- (oxetane, azetidine, cyclobutane, thietane) and spirocycle-containing molecules for use in drug discovery, as well as an expanding range of SF5s and CF3s. SpiroChem also designs customized libraries to facilitate your SAR studies, expand chemical diversity and help you develop the drugs of tomorrow. Synthonix specializes in the medicinal chemistry driven design of novel multifunctional building blocks and synthons. These compounds enable our customers to synthesize structurally diverse molecules for drug discovery and other research applications. Synthonix has recently opened an office in Cambridge, UK to better service our European customers. TCI Europe is the European head office of Tokyo Chemical Industry, a leading Japanese manufacturer of fine chemicals. The product portfolio contains more than 22000 products including 1/3 unique molecules. The majority of these chemicals are manufactured at TCI’s facilities in Japan and are timely delivered to our customers. Tecan is a leading global provider of laboratory instruments and solutions in biopharmaceuticals, forensics and clinical diagnostics. The company specializes in the development, production and distribution of automated workflow solutions for laboratories in the life sciences sector. Its clients include pharmaceutical and biotechnology companies, university research departments, forensic and diagnostic laboratories. Timely and accurately supply you with the top quality small molecule organic compounds for your research: ** 1.3MM stock items available in HTS amounts ** 25K unique organic building blocks ** Fragments for FBDD (subset of molecules selected on the basis of Rule 3 and passed through other proprietary filters) ** Collection of scaffolds ** Targeted libraries for most popular biomolecular targets. Established in 1998 we have the knowledge and expertise to serve your requirements. WuXi AppTec’s Pharmaceutical Services span the entire research and development platform, including target validation, structural biology, high-throughput screening, hit-to lead and lead optimization including in vitro & in vivo biology, ADME/DMPK, medicinal & computational chemistry, design and synthesis of molecules and peptide, templates and libraries, and core analytical services.